Porch-on-steroids or "addition lite?" 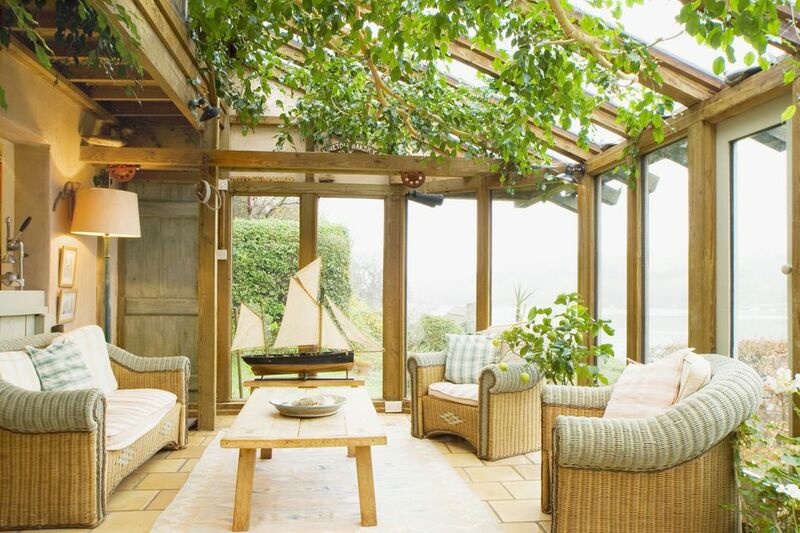 Sunrooms occupy a hazy middle ground between enclosed and not-enclosed; between real structure and porch/deck. Some sunrooms are site-built with lumber, trusses, joists, foundation, electricity, and sometimes even plumbing; except for the large number of windows and skylights, they might be called room additions. Other sunrooms are kits fabricated often across the country and shipped at high cost to your location. These sunrooms, in some cases, can be built right onto an existing concrete patio slab or sturdy deck. Join us on a journey through the world of sunrooms, as we explore various ideas for expanding the living space in your home. This sunroom idea brings the indoors to the outdoors. High-quality patio furniture with table lamps and low-pile carpeting gives this sunroom an inside-the-house look. In the classic pre-fabricated sunroom, nearly every surface is transparent. But these are not windows. This structure uses a type of wall glazing called DuraPlex. Prices for this type of sunroom run between $7,000 and $25,000. This is as fancy as a sunroom gets. Pioneer actually calls it a conservatory, which is probably a fancy name for "sunroom." If I had an extra $100K or more, this is what I would build. TEMO calls this sunroom idea "walls only," meaning that you're walling in and covering your present patio--one of the more cost-effective methods. What? You mean this is a sunroom? That's the point entirely. This sunroom, part of TEMO's Nino Vitale Signature Collection (Vitale was the founder of TEMO) cunningly blends in with the rest of the house. This custom-made sunroom features soffit and fascia, interior crown, and matching paint and masonry. This is a pre-fab sunroom that approaches site-built.